This was a regression in behavior from running Quicken 2011 R8 in Windows 7 SP1 where I was using the same file at the same directory without any issues. To workaround this I renamed my original QDF file from “RyanR Quicken Data.QDF” to “RyanR.QDF” so the filename was 5 characters long– less than or equal to 8. 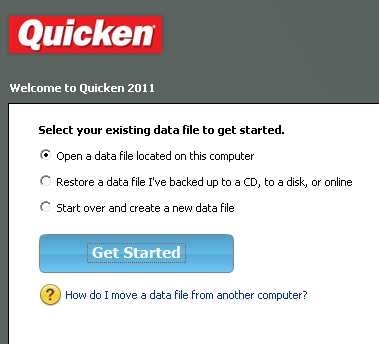 I then re-opened Quicken, chose the renamed file, and then exited Quicken. The next time I launched Quicken it successfully opened the last open QDF file. From this Intuit forum thread it seems that this is a known issue with Quicken. I just don’t know why I never saw this problem until now.